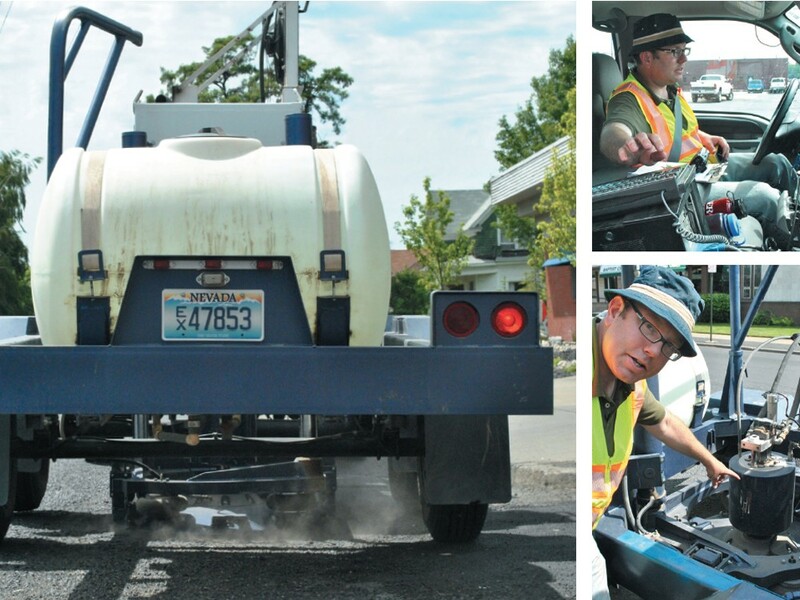 Chris Cothburn and the Vibroseis machine used to study Spokane’s fault lines. On a baking-hot Spokane day, Chris Cothburn sits behind the wheel of a Ford F-250 tricked out with everything a geologist could want. A desktop computer is riding shotgun. A car battery is in the passenger footwell. He raises a walkie-talkie radio to his mouth. “Armed and ready at 282,” he says. A noise like the sound of a revving airplane engine fills the air as the ground beneath the truck’s wheels starts to shake. Called a Vibroseis, the trailer on the back of Cothburn’s truck presses a metal plate onto a ground and emits sound waves. Two pulses every five meters, then the truck moves on. If all goes well, geologists in a cramped RV a block away will start seeing lines on the screen. Once those lines are mapped and lined up, Cothburn, and his colleagues from the U.S. Geological Survey will be able to see a two-dimensional image of the ground that, they hope, will tell them what caused a spate of earthquakes in Spokane over a decade ago. “We’re doing this to better understand earthquake risk in the area and hopefully save some lives,” says Cothburn, a lab manager at the University of Nevada, Las Vegas. The earthquakes in 2001 didn’t do much damage, but they did pique the interest of Bill Stephenson, a Colorado-based geophysicist for the USGS. It’s taken until now to get the money together to come to Spokane. He was busy in the meantime trying to figure out, for instance, why Washington D.C. was rocked by an earthquake last year. “We’re trying to help find the seismic hazard in this area,” Stephenson says. The area Stephenson and his team were working last Friday was about a mile-long stretch of Baldwin and Hamilton streets north of the river. While finding faults can be done from the air, urban areas require a different approach, Stephenson says. Hence, Cothburn and his strange rig. “I told them, this is cooler than Mythbusters,” says Charles Curtiss, who encountered the geologists as he was riding his bicycle towards Division Street to hand out resumes. Across Division, Cothburn’s truck rumbles on, leaving behind plate-shaped rings of dirt as it tracks down Spokane’s faults.